Only Sam is serious enough – and crazy enough – to use this untested technology... but this time he is not alone. Split by centuries, but united by a mutual appreciation for making big ugly monsters explode, Sam and Huff have come to negotiate for humanity’s survival... with stacks and stacks of guns. Sam can now add a giant Cannon to his Gunstack! 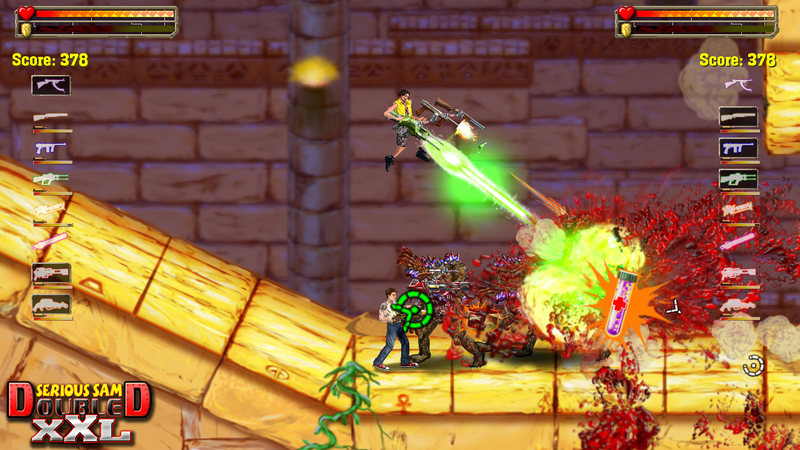 Serious Note: Serious Sam Double D XXL is a NEW and ORIGINAL Serious Sam title! Yippee!! It is officially sanctioned by the original developer Croteam, and is a part of their Serious Sam Indie Series. * One gun sometimes not enough? Two still too wimpy? 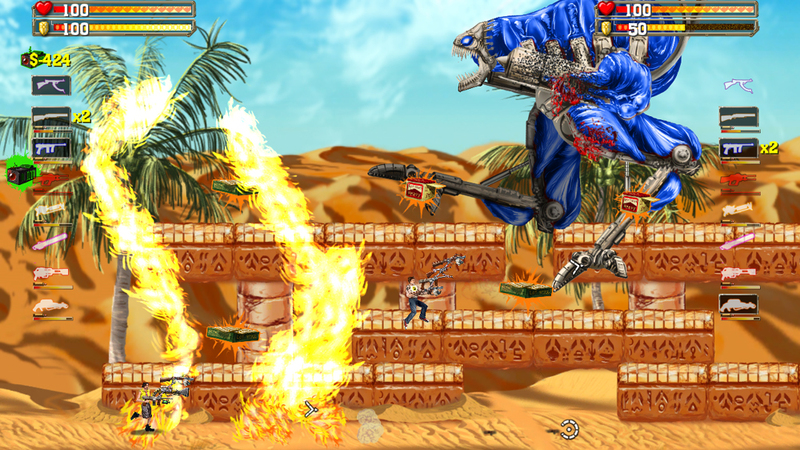 Try firing all your guns at once with the GUN STACKER system! * Two-Player Local Cooperative Play - Huff will be the second playable character! He's that crazy guy from the Gunstacker video! 21 Campaign levels with 3 Sam-insane vehicle levels! * Gunstacker Upgrades - Shotguns that fire a horde of bees, Prism Lasers, the return of Serious Sam’s trademark Cannon and much more! Over 30 new guns to fire! 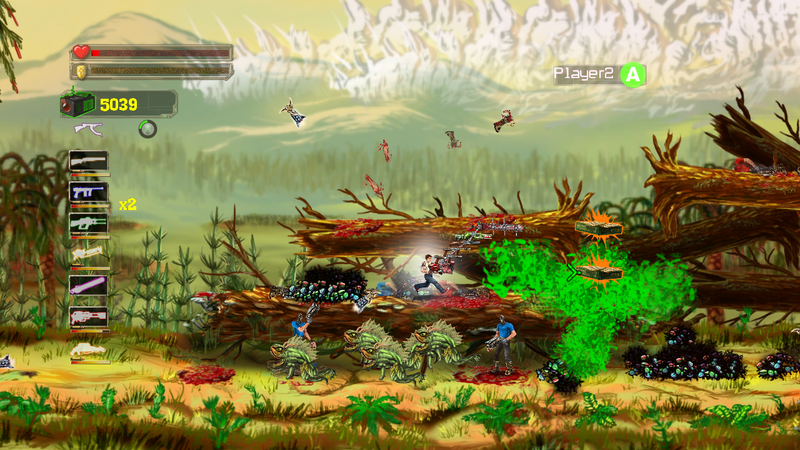 * New Enemies in glorious 2D! Fight fire-belching TORCHER KITTIES, exploding-banana shooting CHIMPUTEES, evil pancakes known as VUVUZELATORS! * Corpse-Piling Technology! Sometimes the best way out is up--on dead monster CORPSES! * Jump Pad technology: Anywhere, ANYTIME throw a jump-pad and get a leg up! 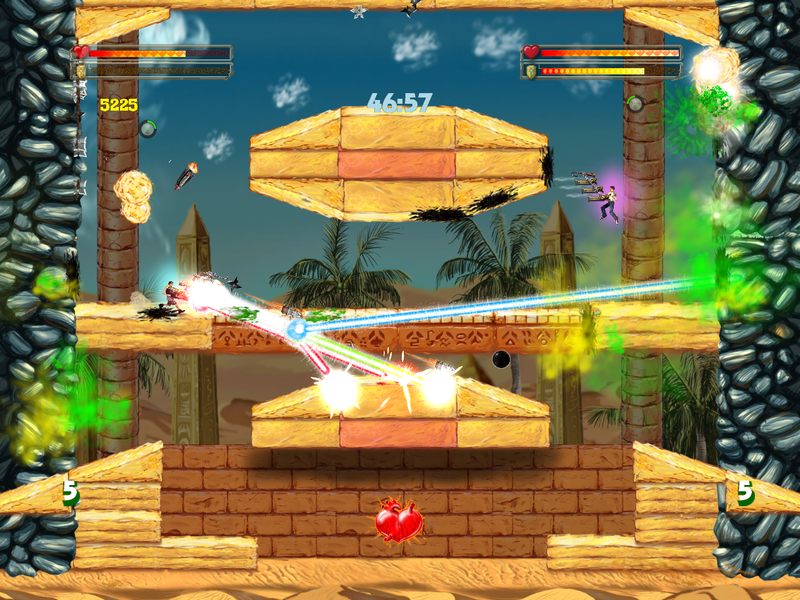 * SECRETS and ACHIEVEMENTS galore, find new max health upgrades, ammo, armor, extra weapons and even comedy secrets! * Unlock 12 CHALLENGE ROOMS such as 4 chainsaw fights, and post your scores on the official LEADERBOARDS! * Unlock 6 HEAD-TO-HEAD Arenas and teach your friend who's boss with a laser rifle stack! 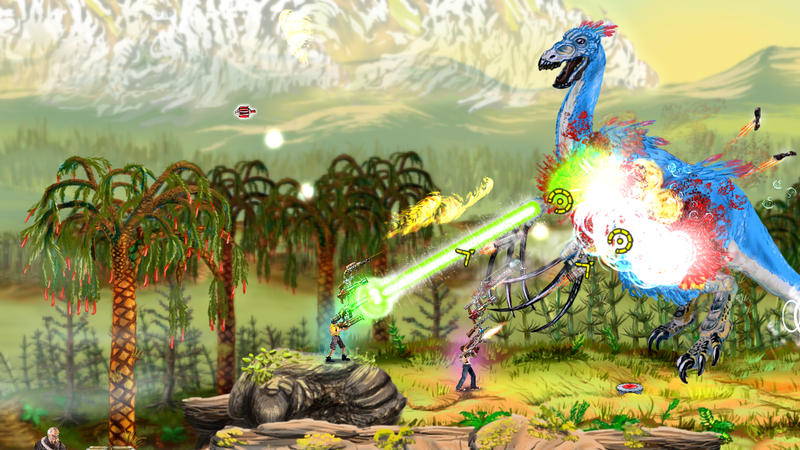 Two player action for twice the firepower! TUNS UV GUNS! Fire tornados for cover, cybernetic bees to lift your troubles away! 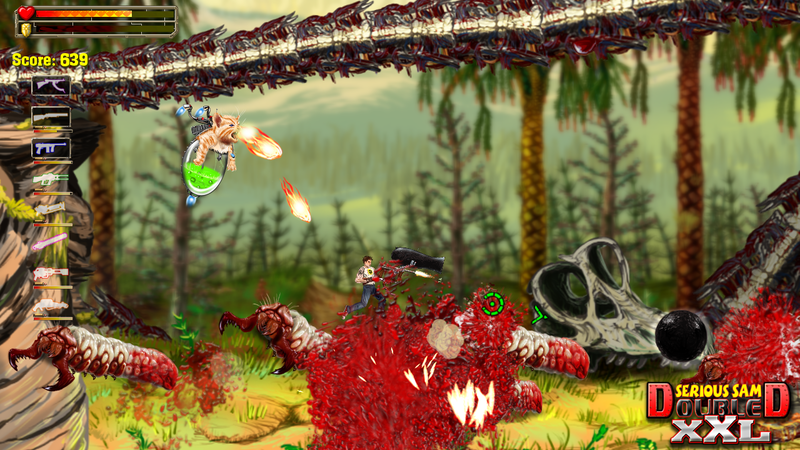 Sam still has to fight legions of monsters, but now he can unleash his own legion of carniverous beetles. Vuvuzelators (pancake monsters). Turns out shooting them is more effective than eating them. Great Jumpin' Dinosaurs! Bring a bud to help fight the crazy. Head-to-Head Arenas: bring all your guns from your campaign and duke it out with a friend! 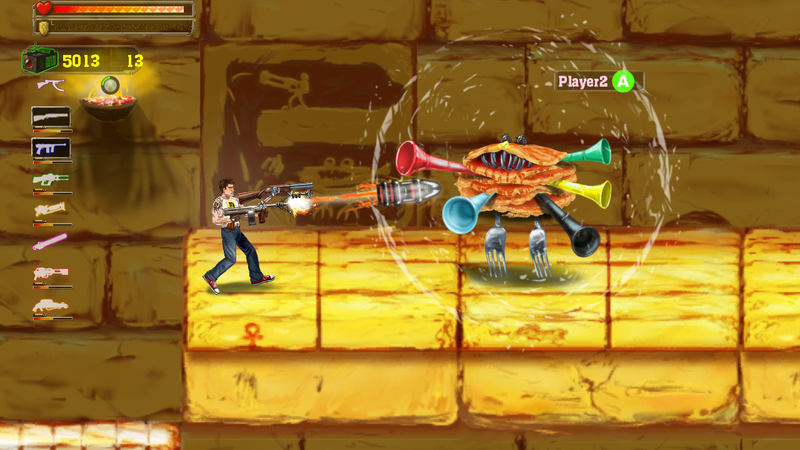 "It may seem like a risk at first, but once you play it, you'll be hooked on Serious Sam DD XXL. At 800MSP... this is one of those games that just, feels right." 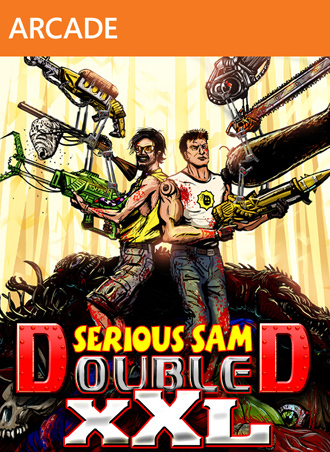 Serious Sam Double D XXL is part of the Serious Sam Indie Series-- read more here!